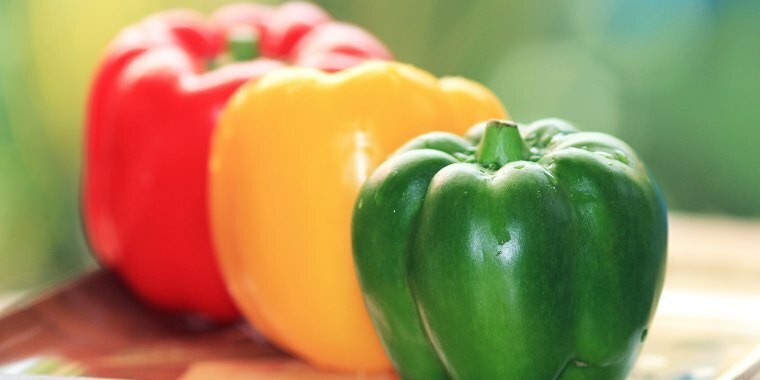 Are red, yellow and green peppers all actually the same vegetable? One viral tweet has the internet totally shook. They're a pretty common veggie found at nearly every supermarket but thanks to a viral, trending tweet, yellow, green and red bell peppers are taking center stage as the subject of the latest food controversy. Grocery shoppers are well aware that bell peppers come in different colors (and often different price points, too) but, judging by the online controversy, far fewer pepper purchasers understand the true distinction between each color. A community of avid tweeters, made up of amateur scientists, stunned pepper eaters and real botany experts joined the discussion to determine, once and for all, what’s cooking with colorful peppers. According to Eade's tweet, all peppers actually originate as green ones then, as they mature and ripen, become yellow, orange and even deep red. According to Wong, Eade's revelation needed a bit more explanation (as many people were quick to wonder if grocers just switched pepper positions around as they matured in store) because peppers only change color while still attached to the vine, meaning some green peppers will stay green in the store no matter how long they're in the produce aisle. All three colors of peppers represent different varieties of the same species. However, a red or yellow bell pepper that's picked too early will stay green. But some green bell peppers which house a specific genetic mutation, much like human traits for eye or hair color, will stay green forever. Even still, each colored bell pepper shares nearly the same nutritional profile, only differing in quantities of vitamin C. Food scientists generally agree that the red bell pepper packs the biggest punch for nerve, brain and heart health due to its heightened levels of vitamin A, potassium and folate, while the yellow pepper holds the most vitamin C.
On average, one green bell pepper costs less than half the price of a red one. Food distributers chalk this price difference up to the red pepper’s greater maturity level since it costs more to harvest. For chefs like Adalja, though, the price translates directly to sweetness. For his rich romesco sauce, for example, Adalja uses only the red variety, but for a beautiful vegetable terrine, he chooses to roast all three colors for not only the combined taste but the visual effect, too. Beyond just flavor, it’s important to remember “that we eat with out eyes first,” said Adalja, and despite each pepper's surprising similarities, color really matters in the final presentation.